There is some truth to the adage that “it’s not the piano, it’s the player” when applied to golf. If your swing is erratic at best, there are limits to what modern golf club technology can do for you. Your time and money would be better spent with lessons from one of the fine Cape Region golf professionals. For golfers whose swings are mostly repeatable, however, improvements in club design in the last several years can truly help your game. If your driver is more than five years old, the results from a newer model can be startling. The recent switch to clubs offering adjustable features multiplied the chances for a great connection between the new “piano” and the player. 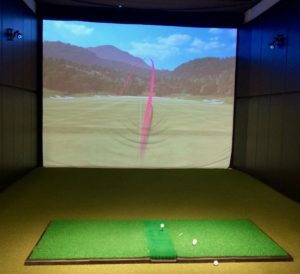 Club fitting companies such as 2nd Swing Golf or Club Champion now compete with local club pros for golfers who know that a well-fit club is within their grasp with a little bit of effort. 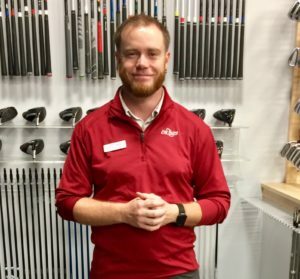 I met the owners of 2nd Swing at the 2018 PGA Merchandise Show, and the Midwest club fitters told me about their new Wilmington store on Concord Pike. Club fitters like 2nd Swing use simulators as part of the process. Yes, that is a hook. In June I went to the Wilmington store for a driver appointment with certified club fitter Alex Wardle. We first established a baseline at a launch-monitored fitting station, with several drives with my regular-shaft G30 Ping, set to 8.4 degrees with a midsize grip. The results were close to my on-course experience, with average carries of 206 yards and about 12 yards of roll. My longer drives are mostly dependent on firmer fairways or a nice tail wind, both of which add to the roll distances. My average backspin rate of 3517 rpm was also similar to what I noticed when using a launch monitor elsewhere. With a swing speed of 92 mph, a smash factor of 1.42 (1.50 is perfect), and a high launch angle (19 degrees), that high backspin was not helping. Wardle next had me test several different driver heads with regular shafts. These included a Callaway 9° Rogue Synergy, a TaylorMade 9.5° M4 White Tie, and a Ping G400 Max 9° driver. In each case the backspin rate dropped and carry and roll distances improved. However, I could not hit consistent drives with the Callaway or TaylorMade drivers. Several went far offline and were more erratic for distance than the Ping. Those factors pushed the club head decision toward the G400. I then tested the Ping model with several graphite driver shafts. I tried Alta stiff and regular shafts, as well as a Tour 65 regular and Aldila X-torsion stiff and regular designs. Each shaft produced a different dispersion pattern. The Tour 65 went longest but also shortest. The X-Torsion regular was more consistent for distance, but varied more than the others from left to right. The X-Torsion stiff shaft produced the best overall results for distance and direction. Considering that my typical driver swing speed is between 92 and 98 mph, the stiff shaft results were a bit surprising. I thought those shafts were for golfers with swing speeds north of 100 mph. The numbers on the computer screen said otherwise. A driver fitting at 2d Swing costs $150 for a new club, with the payment subtracted from the purchase price if you buy from them. The company offers trade-ins for your existing club. Similar arrangements can be made for fairway woods, hybrids, irons, and putters. You can also bring the printout of your test results to your club pro and have him put your new club together. Wardle was polite, helpful, and informative. The session took a bit more than an hour, which seemed to pass by quickly. The new club is performing nicely, especially with drives into the wind. My better drives are also more consistent in direction than I had been with the G30. At the fitting station the predicted average distance improvement was 18 more yards, and that has also held up in regular play. With firmer fairways drives with the new club go much farther, but with all the rain we’ve had in the Cape Region that’s still a rare treat. Club fitting may have once been considered something only the pros do, but that’s just not true now, if it ever was. The process of tailoring your clubs to your swing is both easy and practical. Golfers who don’t take advantage of this opportunity are not doing themselves any favors. The Rehoboth Beach CC 18-Hole ladies group played a team gross/net game Oct. 10. Britny Whitby, Gina Bergin, Beth Carpenter, and Lora Drewer (blind draw) won first place gross. Sharon Emerson, Becki Hertrich, Reagan Roberts, and Beth Forbes won first place net, with Daisey Hudson, Carole Medd, Gayle Truitt, and Pauline Porter in second. JoJo Barrows won closest to the pin on the 19thhole. The Kings Creek CC Ladies 9-hole group played a low net game Oct. 10 to conclude their 2018 season. Sandy Neverett won first place, with Carolyn Horn in second, Sue Eisenbrey in third, and Mary Beth Merolla in fourth. Horn was also closest to the pin on the 17thhole.